My relatives' homeland was France, where our name means "low set". A lot of my cousins still work there, trailing rabbits and deer, among other things. I have a real interesting personality when you get to know me and I enjoy people and families. I do have that �hound dog' in my blood, though, and when I catch a scent that interests me, I'm off and running, regardless of these short little legs. If you want me to stay in your yard, you'll have to have a good fence! Like all hounds, I have a deep voice and I use it a lot. If you have close neighbors, they don't always understand that I just can't help but bark at squirrels and birds. When fully grown, I am between 13 and 14 inches tall (33 to 35.6 centimeters) and I weigh between 40 and 60 pounds (18 to 27 kilograms). 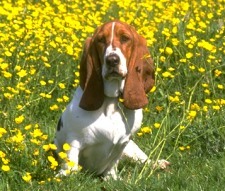 We have no Basset Hound Breeders listed at this time. Click here to place your Basset Hound Ad!